Gurney Journey: Can three artists work simultaneously on one picture? Can three artists work simultaneously on one picture? 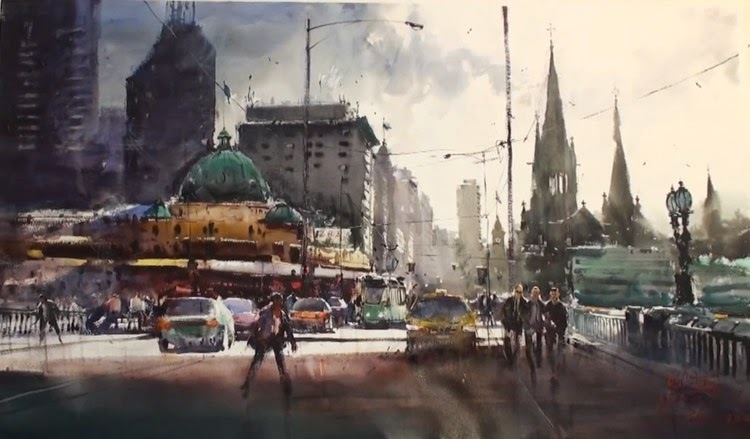 This Australian street scene was painted on one giant piece of paper by three master watercolorists: Joseph Zbukvic, Alvaro Castagnet, and Herman Pekel, who call themselves The Three Caballeros The Three Amigos. Fortunately the fun was captured on 24 minutes of mesmerizing video. (Direct link to video) They switch back and forth between big and little brushes, spritzers, and scrapers. They constantly trade places, with one guy diving into a wet area that another guy started. Their uproarious good humor and utter fearlessness is an inspiration to any painter. Castagnet, Watercolor Painting with Passion! 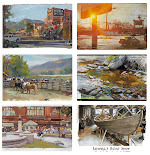 Another great YouTube video showing J. Zbukvic painting a rainy street scene. I can't wait to watch the video. The painting, on its own, is full of great energy and vitality. The joy that went into the painting is visible. Thanks for turning up another gem, James! I know I'd have missed this otherwise! Apart from a learning experience it was such a delight listening to them banter and watching them play. They are SO fun!!!!! Thanks a million for sharing this. I shall be grinning as I go about my day thinking of them splashing and dribbling. The video is great! It's such a delight to see the fun that those three amigos have painting together. 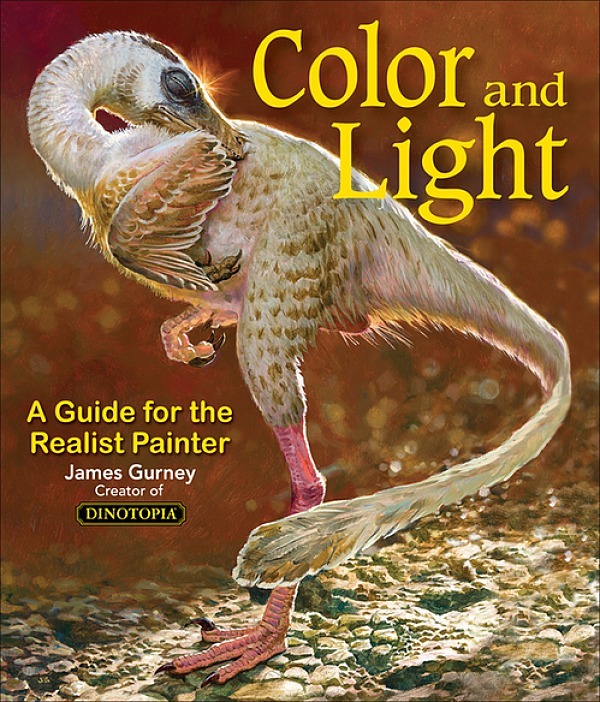 It's a good reminder of why we all got into painting in the first place: it's fun! I'm being a stinker here but I have to make a tiny correction to James' post. (I guess I listen to too much NPR) The guys actually call themselves "The Three Amigos". Beautiful imagery, that. I wonder which one is supposed to be Martin Short? What fun! But I have another question: Can a painter really paint while wearing sunglasses? That was great fun to watch! I love their fearless confidence, and the idea that it wasn't about being too precious with every mark, but it was about having fun and making an expressive statement. Oh my god - these guys are in Melbourne!? I'm totally going to stalk them...err politely ask to watch them work. So cool! Fantastic painting, and really nice painters. One question: when they spray water on a wet color, why don't they get the so called "cauliflower effect" (the water digging a hole in the paint)? Mario, I think the reason is that they only spray while the area is still wet, the object being to apply the mist before the area dries. Spraying after the area dried would produce the effect you describe. Also, it's notable that the water is misted, not sprayed. Yes, Tom, the water is being misted, that's important, of course. According to my experience, the cauliflower effect happens even if the area is still wet: it happens every time the new stoke is wetter than the paper. But if the area is very wet, you can probably avoid it. "You get cauliflowers if the new wetness is denser than the existing wetness with paint"
desembrey, I guess you meant the opposite, as you explain in the last part of your comment. But, in this case, when you spray/mist pure water on a wash, you shold always get cauliflowers, because pure water is always less dense than any other wash... hence my question. It's a pity Zbukvic's book is out of print.